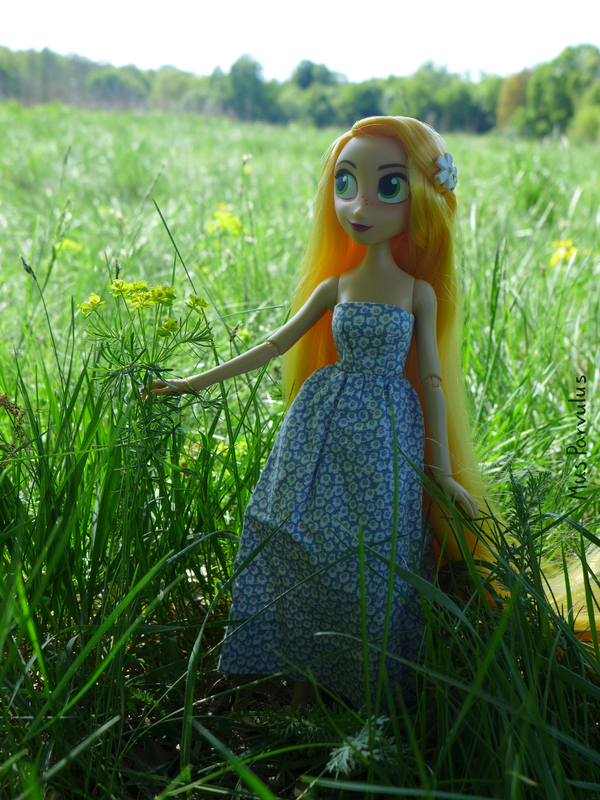 Springtime continues, and so do opportunities for many pleasant walks in the nature ( I’d probably miss most of them, if I wasn’t motivated by my dolls). 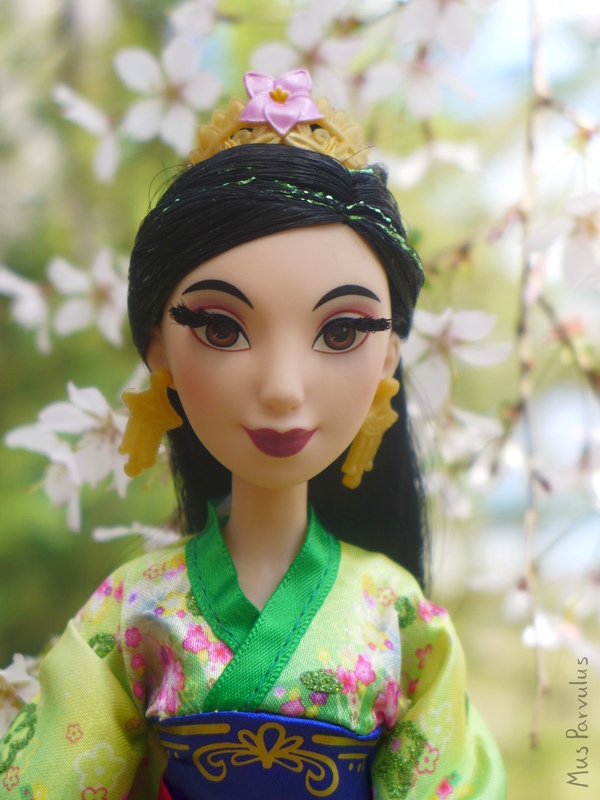 Still in the botanical garden, I found a spot that suited Mulan quite well. I hadn’t been to the botanical garden for years prior to this spring, and I didn’t realise it even had a Torii gate, which made the setting even better! By the time I discovered it, my camera battery had already died, but agreed to start back on for a few more pictures, as if understanding the gravity of the situation 😉 I would have been inconsolable otherwise. 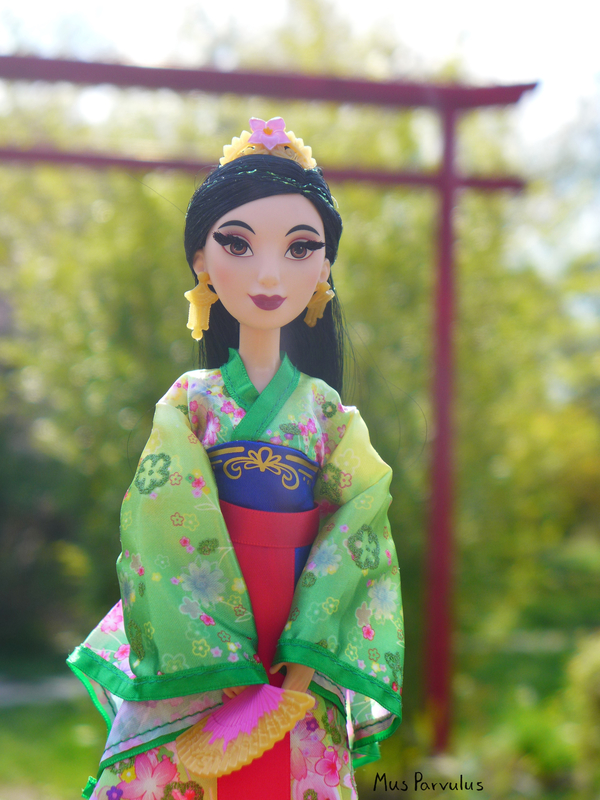 The sign said that this was a Japanese gate… but perhaps Mulan is travelling? After being stuck at home with a cold for a few days, I finally grabbed Snow White and rushed outside. I have been really hoping for some snow. I’m used to thinking that you can’t have true Christmas photos without snow, but with the weather having been all but snowy for the past few Christmases, I guess it’s time to review my perspective. 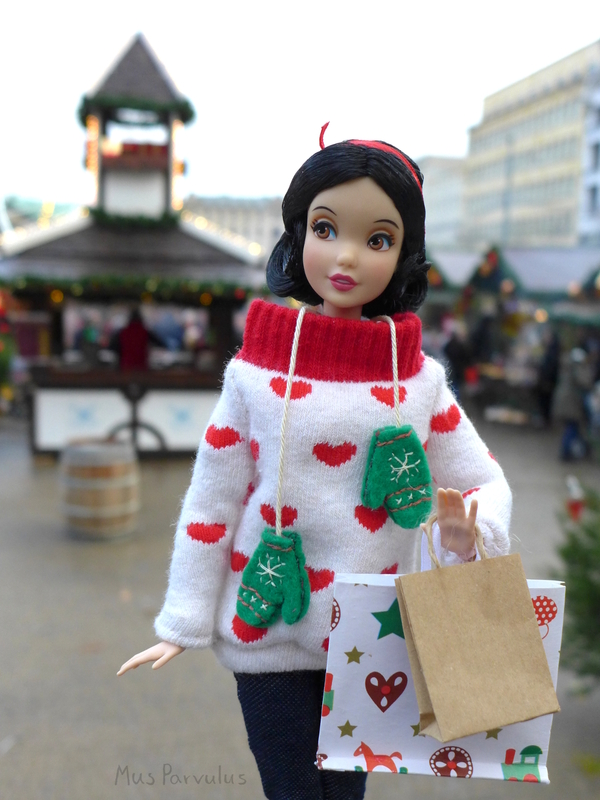 Luckily, the city has helped bring some jolly spirit to the streets by setting up a Christmas Market. 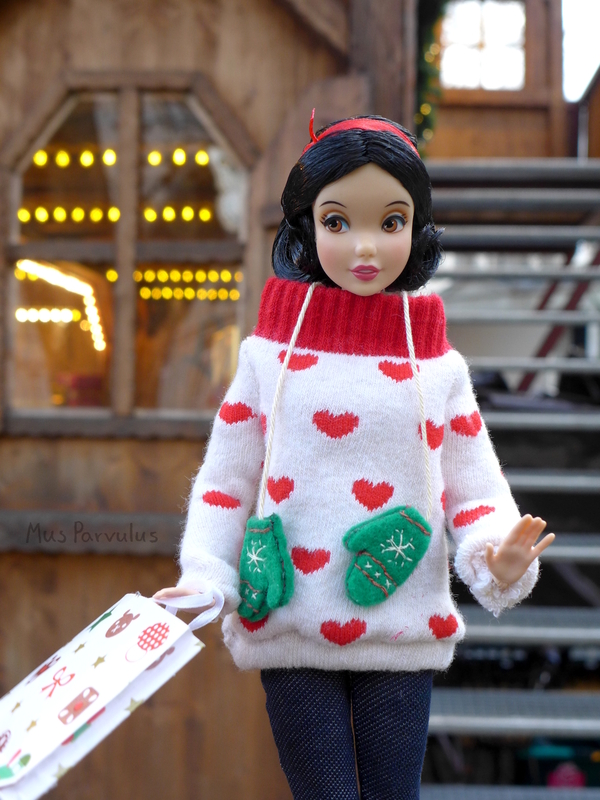 I prepared some comfy winter clothes for Snow White (and eventually other Barbie sized dolls). 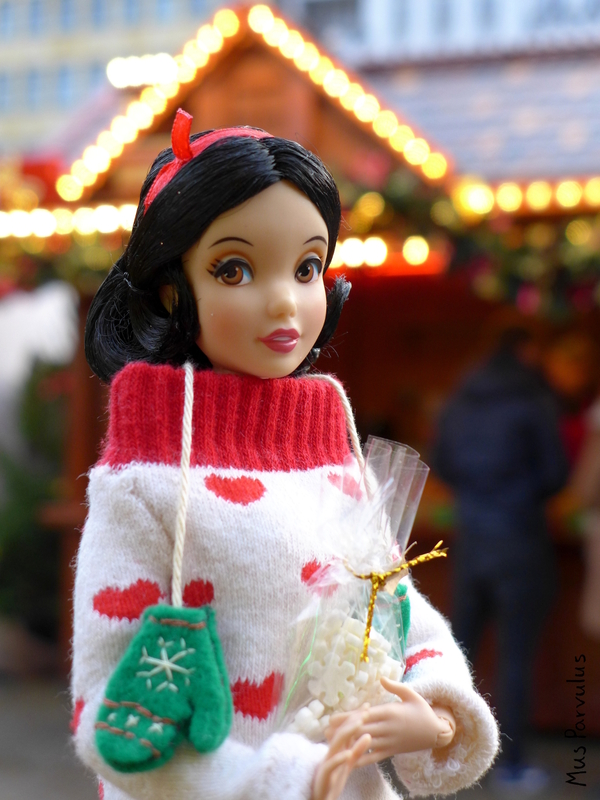 She is wearing a sock sweater, which is not overtly Christmassy, but in keeping with the season’s colour scheme. I also made her leggings from old leggings of my own. 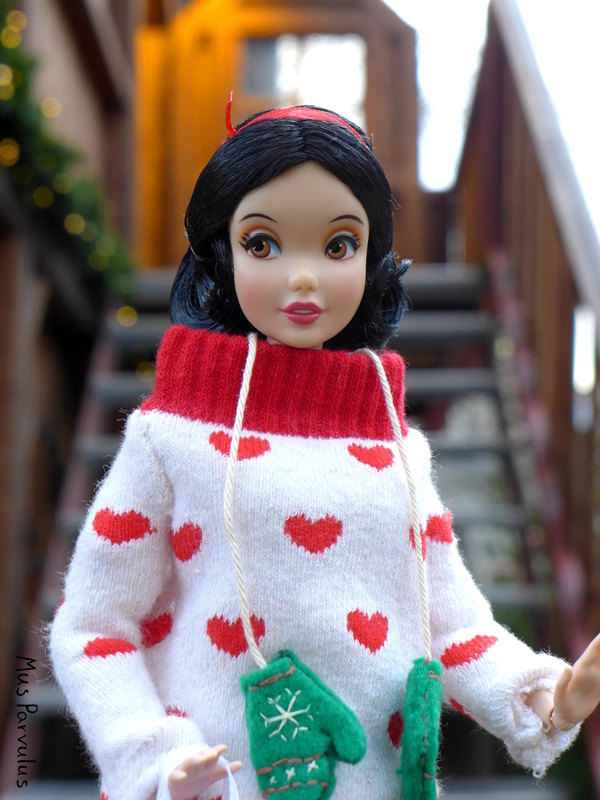 Finally, for a fun touch, I made her mittens on a string with a design stitched to them (to the best of my ability). I really liked the wooden huts. They looked all wintery and festive with the lights and garlands, providing some lovely backgrounds. 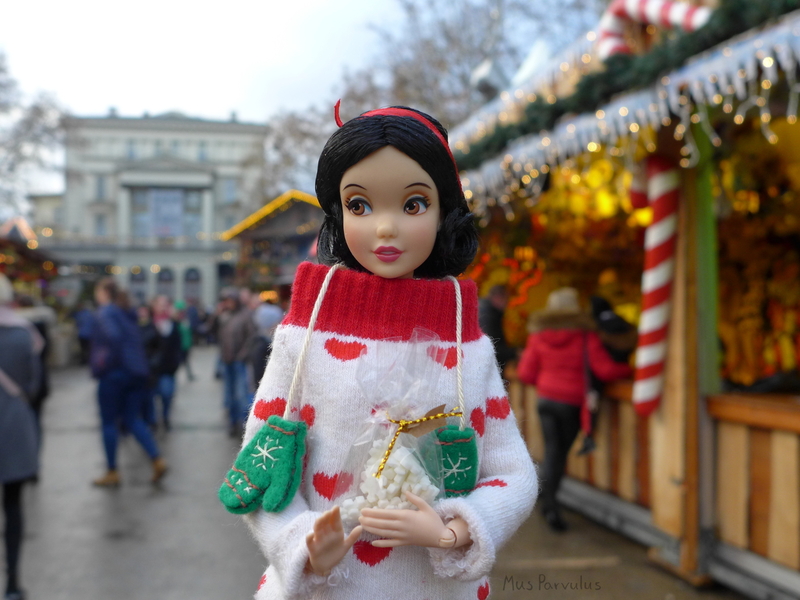 Apart from the wooden huts selling treats and handicrafts, there was an ice sculpture contest going on in the market square, however, what is the point of ice sculptures if I don’t have an Elsa doll? In all seriousness, I decided against going near because of massive crowds of people. I don’t really enjoy sewing, it’s just a means to an end for me. I always imagined that if someone requested a substantial sewing favour from me, I’d try to politely explain this and decline. However, when a situation like that finally came up, it played out rather differently. 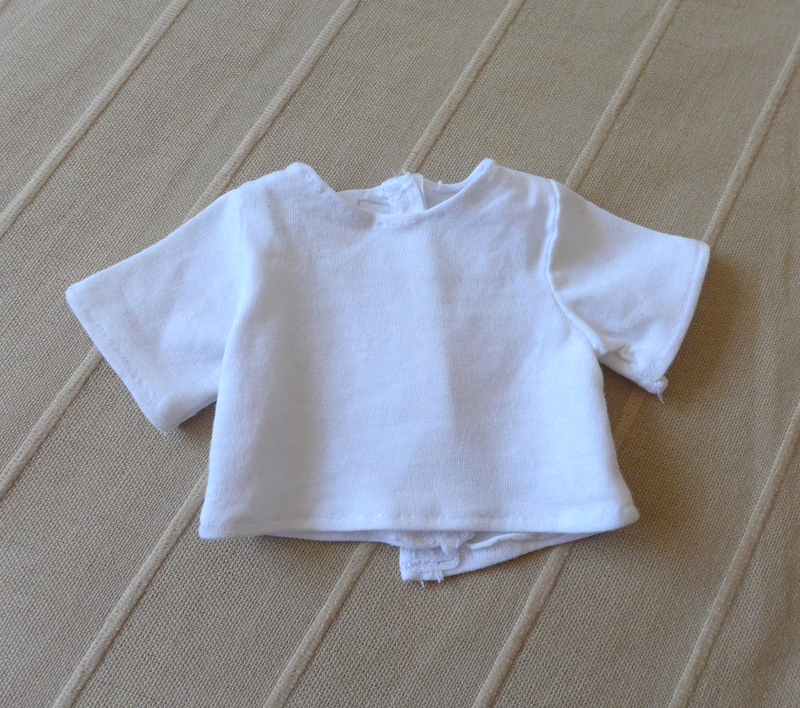 Recently, a friend asked whether I would make some clothes for her doll. 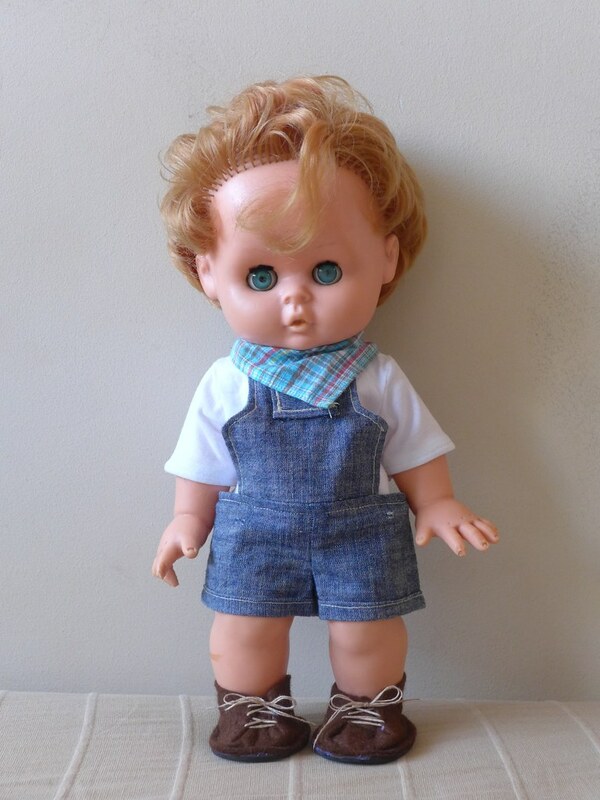 She said that the doll’s name is Yasha, and that he got him as a gift from a boy who liked her when she was a teenager living in Russia – some 50 years ago. She explained that Yasha came with an outfit, of course, but he was played with a lot over the years, also by her children, and the clothes were lost in the process. She said she made him a makeshift covering, as seen below. When I first got Yasha to work with, he was kind of… dirty. I don’t mind, and I’m assuming he stayed this way simply because we get used to things gradually collecting dust and such, and stop noticing it. 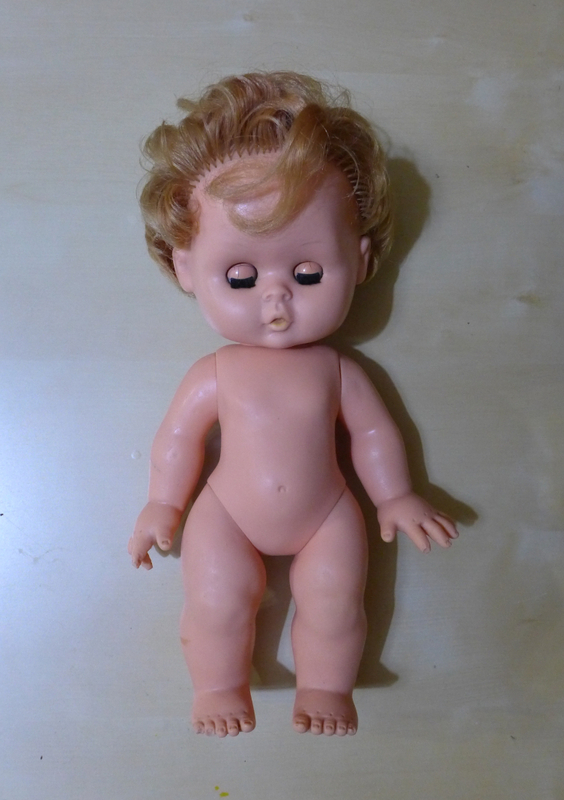 I knew where to look for doll cleaning tips, but I was hesitant whether it would be a welcome intervention or not. In the end, I decided to only gently clean him with a damp magic eraser, no detergent, no submerging in water. (Spoiler: my friend did notice and did not seem to mind). Yasha looks like a toddler doll to me, but since I wasn’t sure, I wanted to go with something versatile age-wise. I decided on a fairly classic-but-cute outfit: overalls, a top, and a bandana. 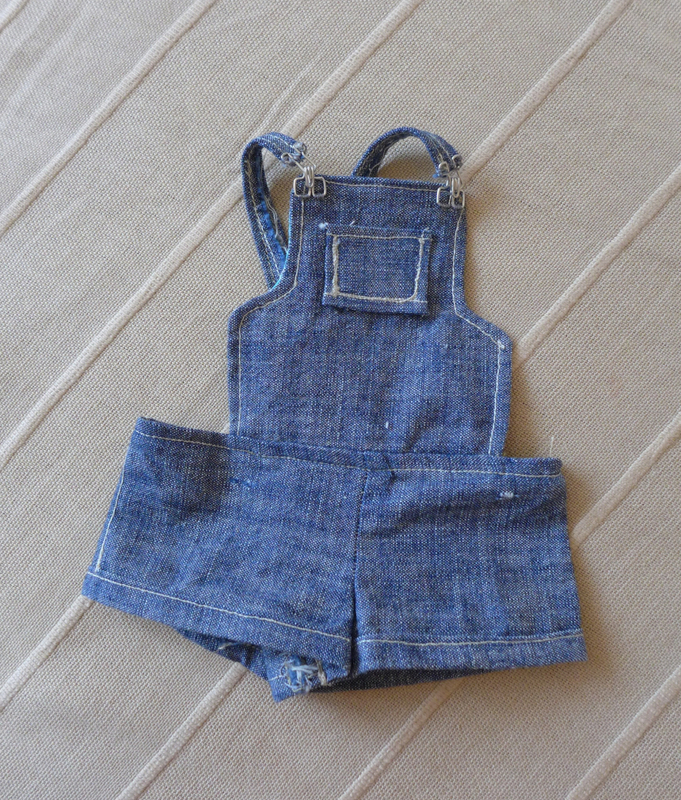 I made the overalls according to the tutorial by MyFroggyStuff (it is my go-to for overalls for all sorts of dolls). I made one alteration, though. 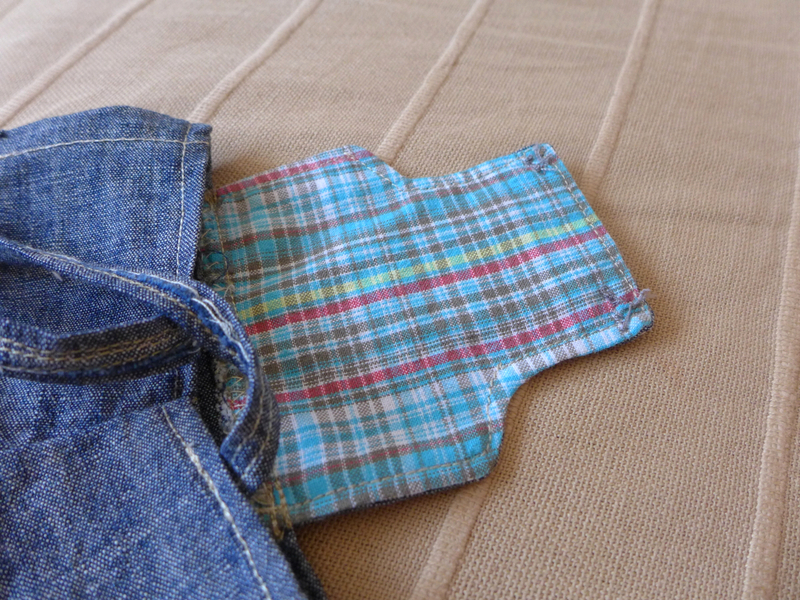 Instead of folding and hemming the bib, I added lining. I find it both easier to make and better looking. The top is as simple as it gets, a white cotton tee. I really thought that it would look best this way – simple and classic. 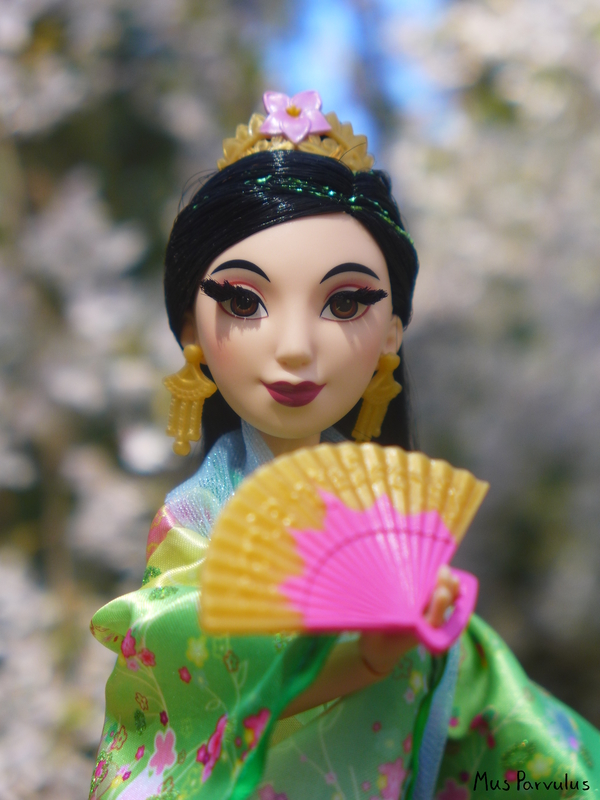 I also find that white is a good colour choice for dolls because it doesn’t clash with reddish vinyl tones, as many other colours tend to do. I used an Animator’s pattern and it was almost spot on, I just had to make the shoulder seam narrower. Probably because of my relative inexperience, this already took me a couple of hours, but I still wanted to send Yasha home wearing shoes. 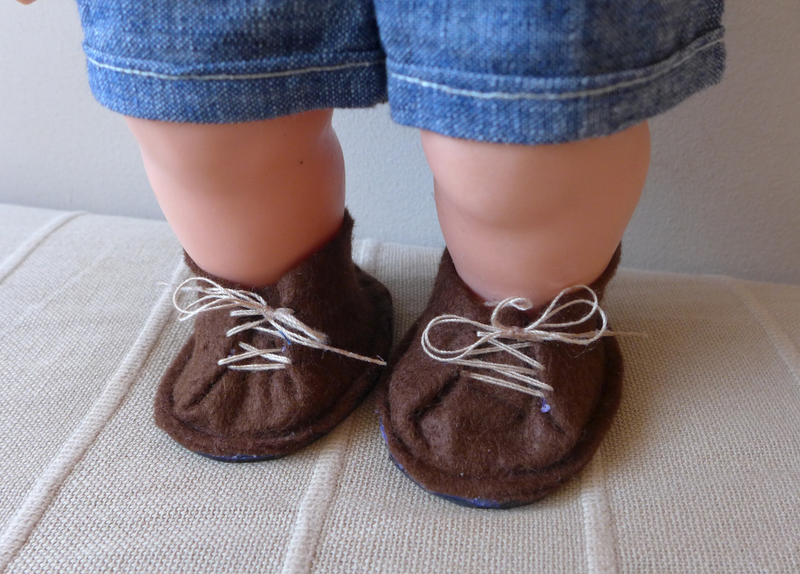 I went with the simplest shoes that weren’t ugg-looking (I do like Uggs on dolls, but not necessarily worn with shorts…). I roughly followed a set of instructions I found on Pinterest. Unforunately, I don’t know who the original poster was. Nonetheless, the link to the image is here. I also glued my shoes to craft-foam soles. I’m happy to report that my friend seemed happy with Yasha’s new outfit 🙂 Complementing the handiwork is the customary reaction to a gift or a favour, but beyond the words, it was the way she kept glancing at the doll throughout the evening made me believe she really meant it 🙂 If so, I truly am glad. 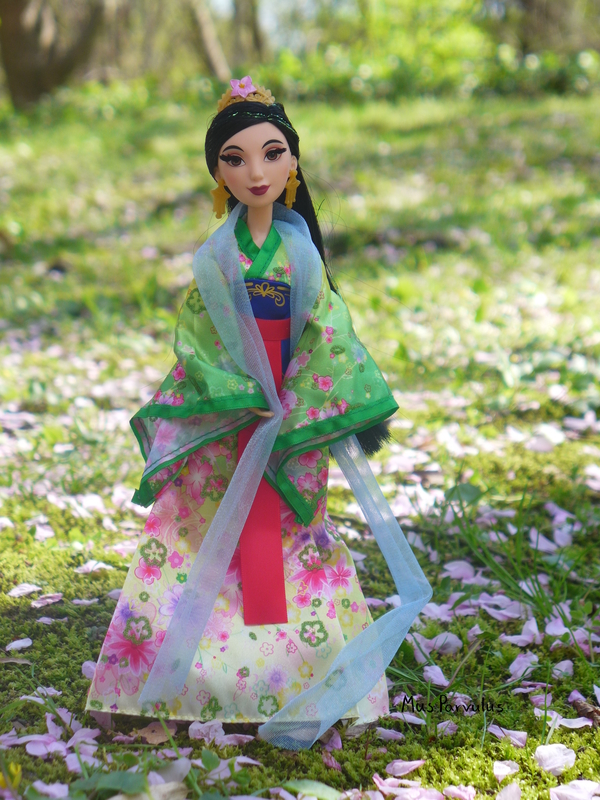 It’s wonderful to think that my craft played a part in a long story of a cherished doll and brought more enjoyment to it. 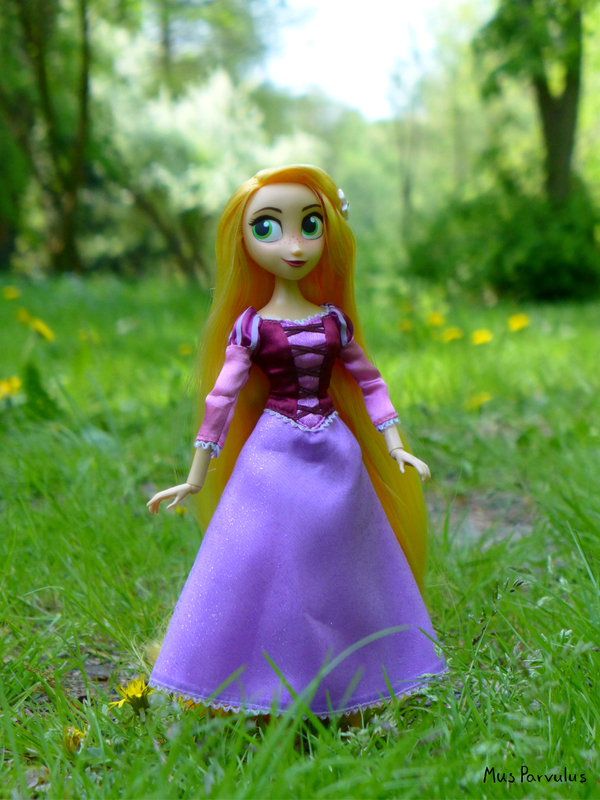 We have already had a full season of Tangled: The Series showing Rapunzel’s adventures after leaving her tower, but I still think back to how it must have been like for her to touch the grass and see the world for the first time. Or even the first couple of times. 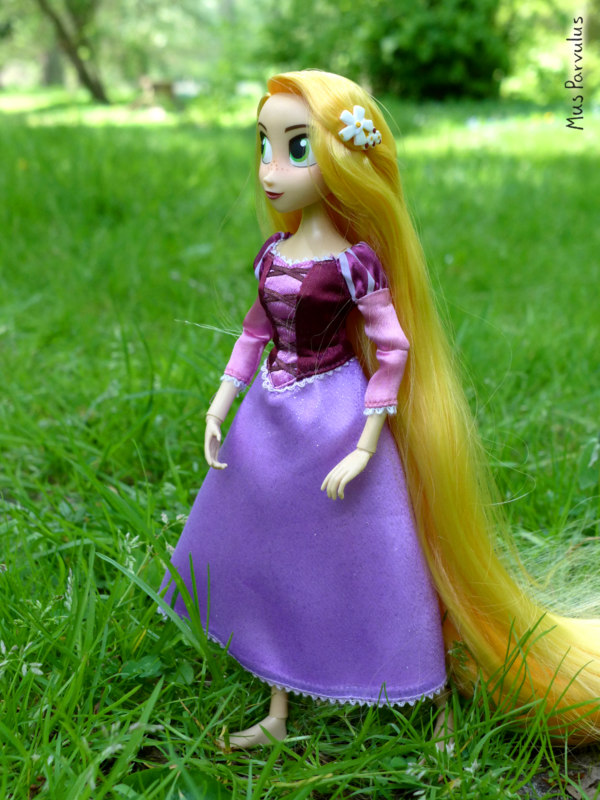 Whenever I take my Rapunzel doll outside, these ideas come back to me. I’m not certain if it can in any way show in photos, but in my head I imagine her filled with a sense of wonder. 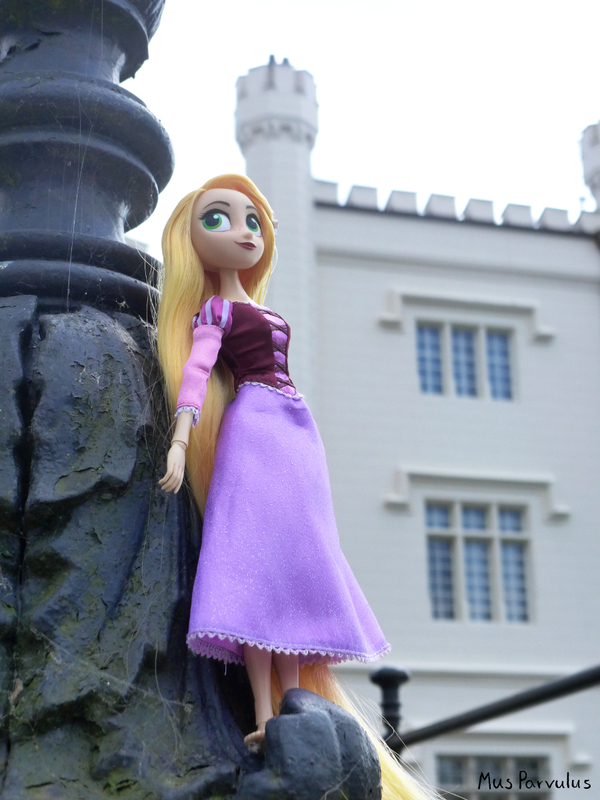 My recent trip was to a park with a small castle which also loosely reminded me of Rapunzel’s tower – not in it’s shape particularly, just by virtue of being a castle. Here, above, I imagine her sneaking out. She looks more cheeky about it than scared, and, honestly, it’s better that way. 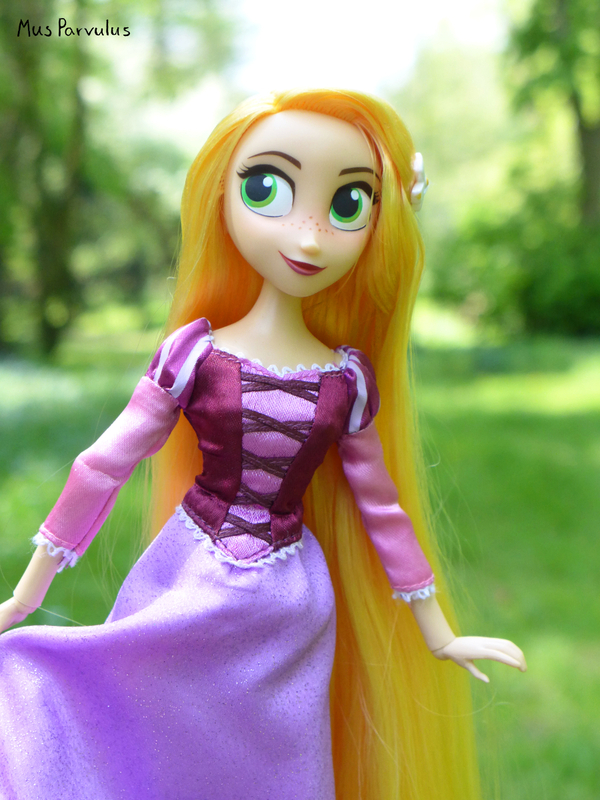 The purple dress that Rapunzel is wearing is of course her signature outfit which came with the set – not my own work. 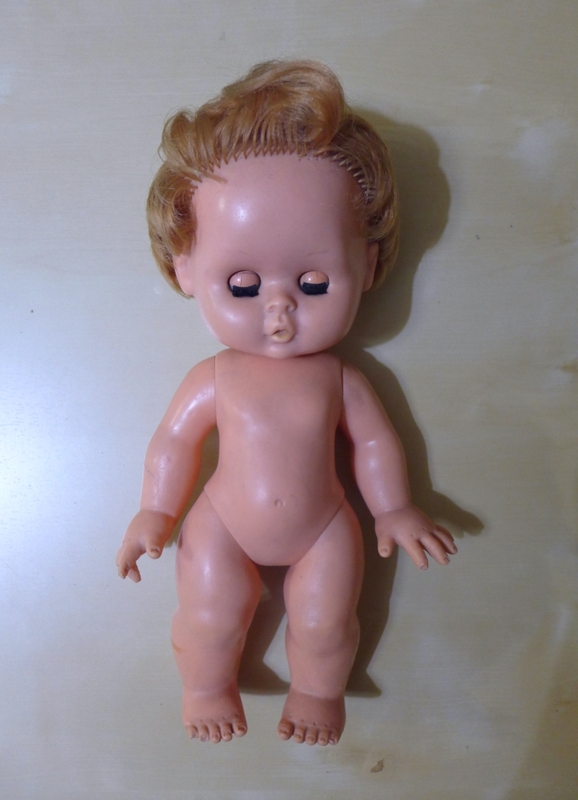 Even though I’ve had this doll for nearly a year, I have not previously posted photos of the doll in its original state. 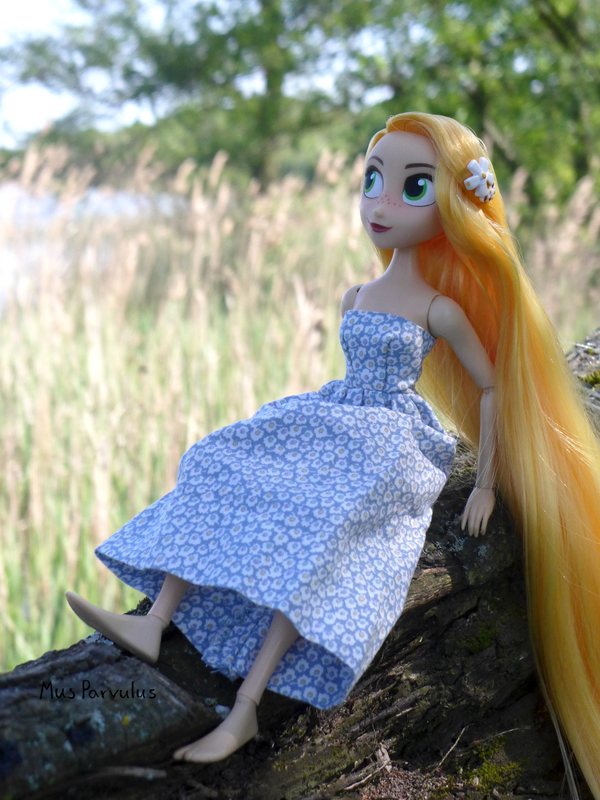 I was so sure I was going to do a proper review, but I utterly hated all the photos I took for that purpose – and not just once! 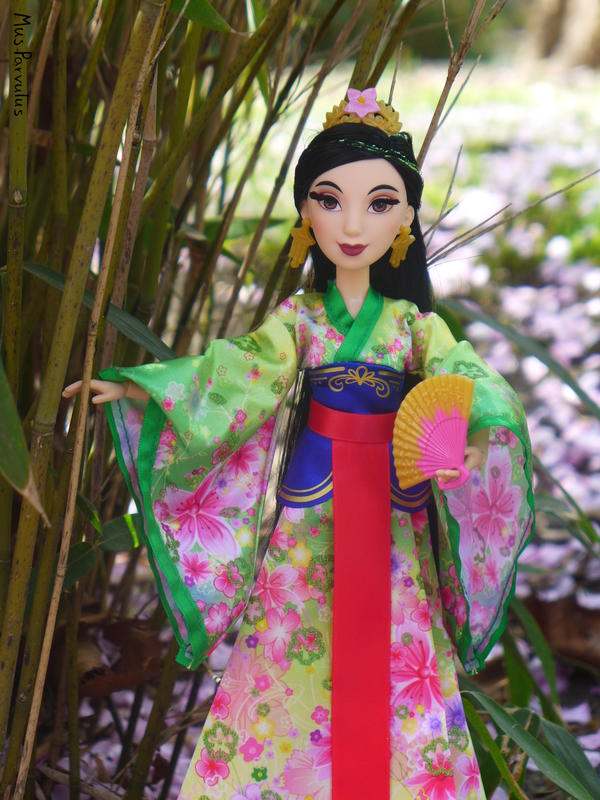 So, in case it never happens: I do recommend her, but be aware that the articulation is not as great as you might expect – the joints are numerous, but have a relatively limited range of motion. The doll certainly has a lot of charm as well, and I love how well she reflects the style of the animation of the Series. 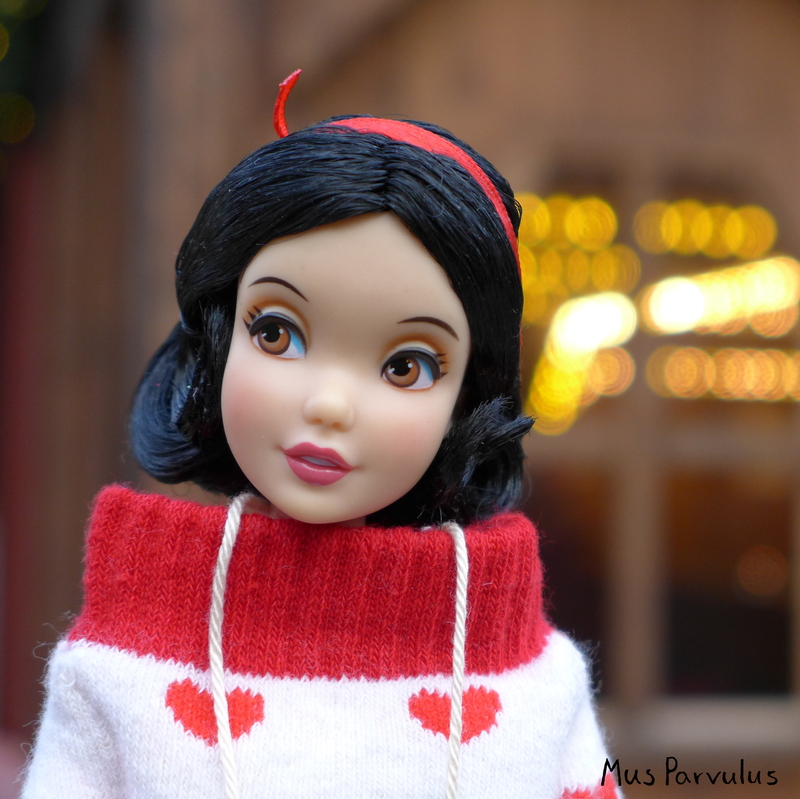 I like her more than the classic Disney Store dolls for this character. 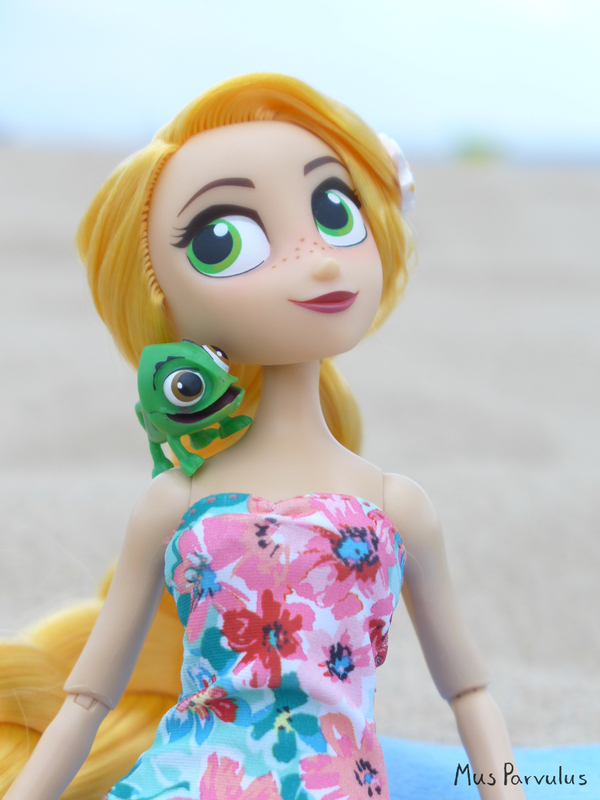 Oh, and Pascal came along too. Not only that, he came back home safely too. I’m always a little worried about these little parts getting lost outside. This is exactly what parents warned us against as kids. 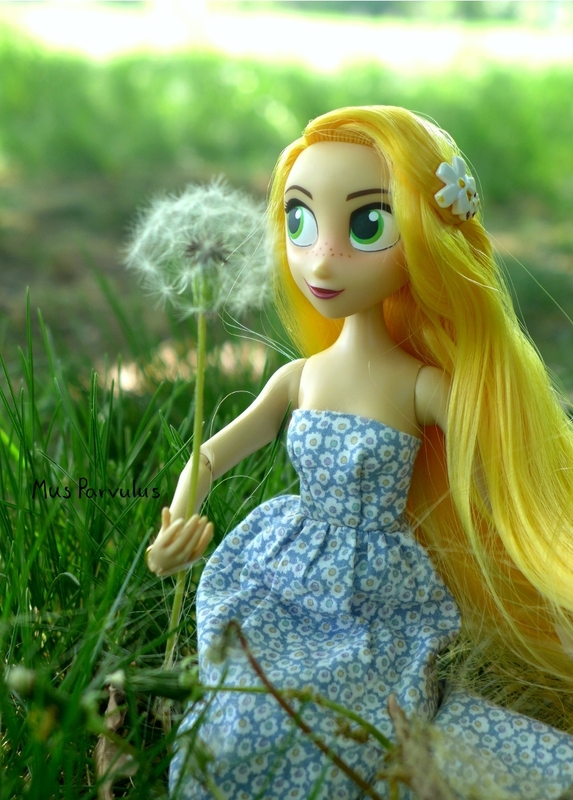 Well, a doll photographer lives dangerously. 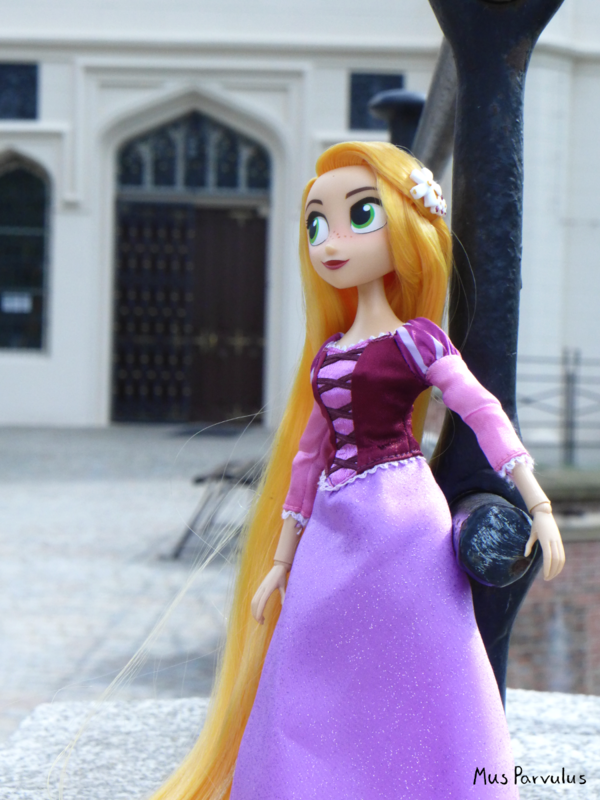 I must say that all those failed attempts at reviewing this Rapunzel doll – all the horrid looking photos with an odd tint (not available for public viewing ;)) left a bad taste in my mouth and affected my enjoyment of the doll overall. Thankfully, I feel that these recent experiences have covered that up. 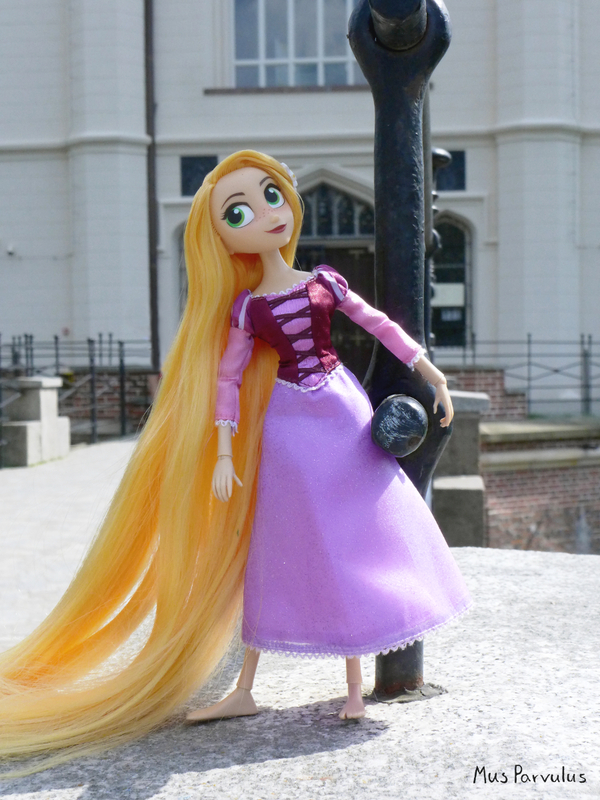 After all, she really is a pretty doll – and certainly a unique one. 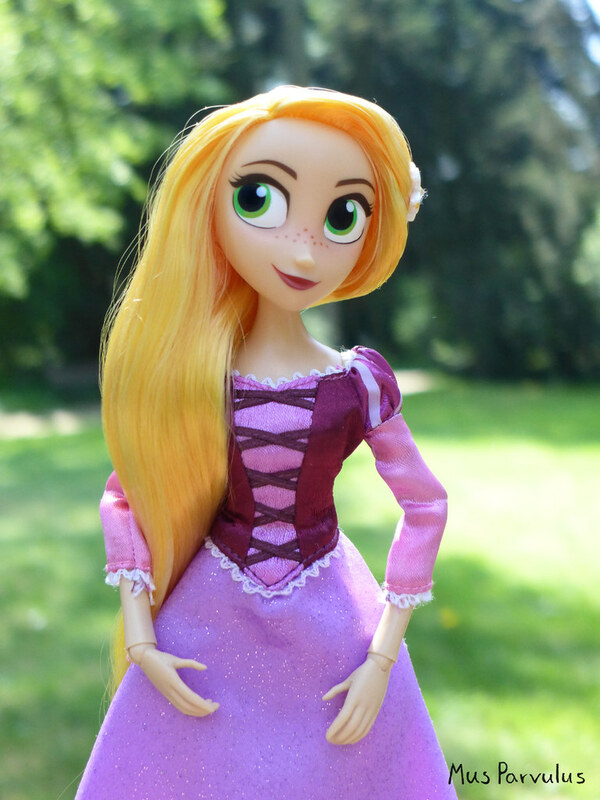 Just before leaving for holidays I received a package containing my most recent doll purchase: “Tangled: the Series” Rapunzel from the Disney Store. 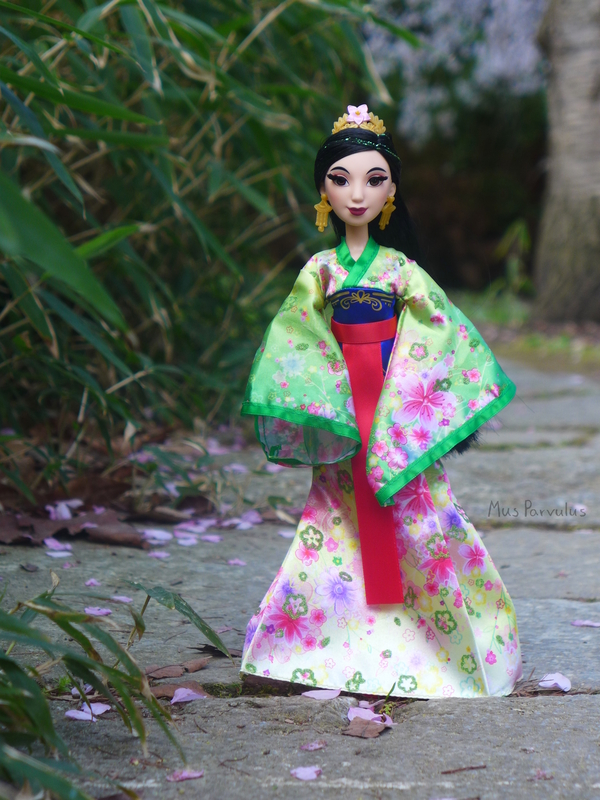 After a moment of deliberation, I decided she is the doll that should come along. 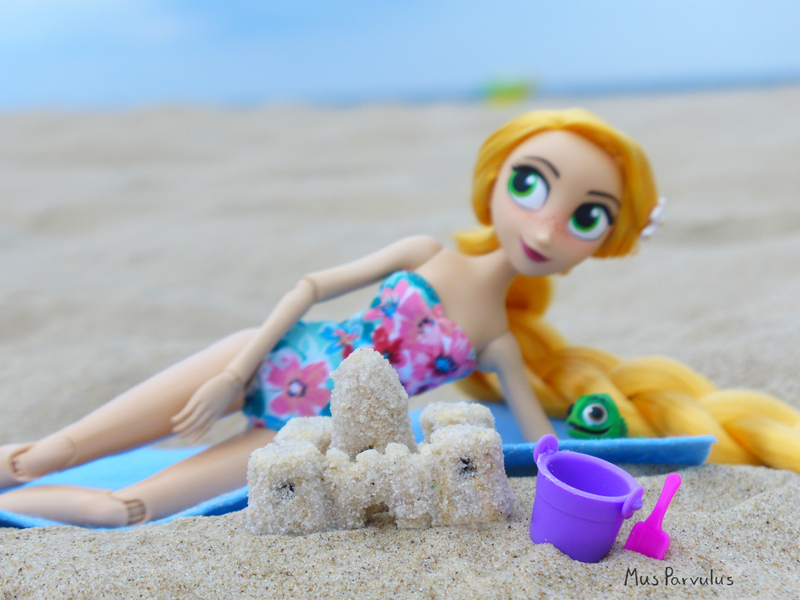 Rapunzel’s signature dress wasn’t very fitting for the beach, so I quickly put together a swimsuit. 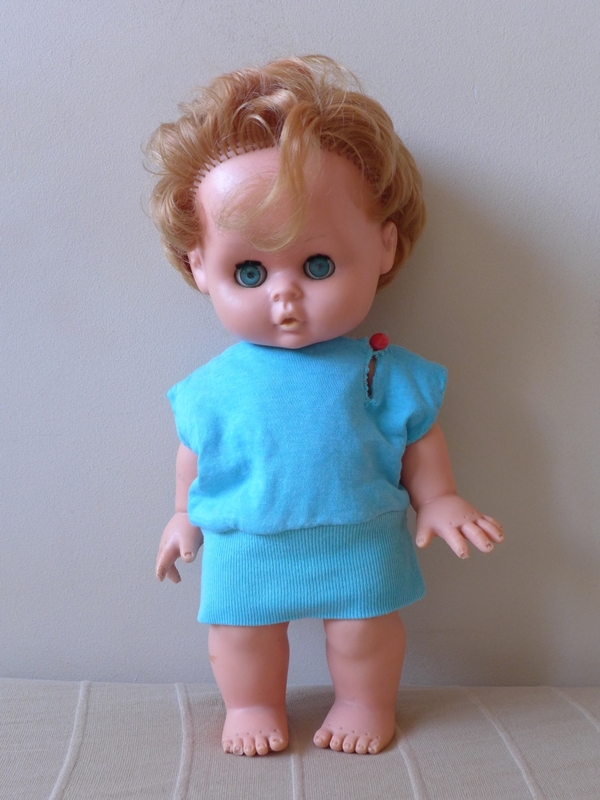 This doll is still very new and there aren’t any appropriate sewing patterns that I know of, so I had to make one from scratch. If I tidy it up, and make sure it can reliably make a fitting swimsuit every time, perhaps I can share it for others to enjoy. 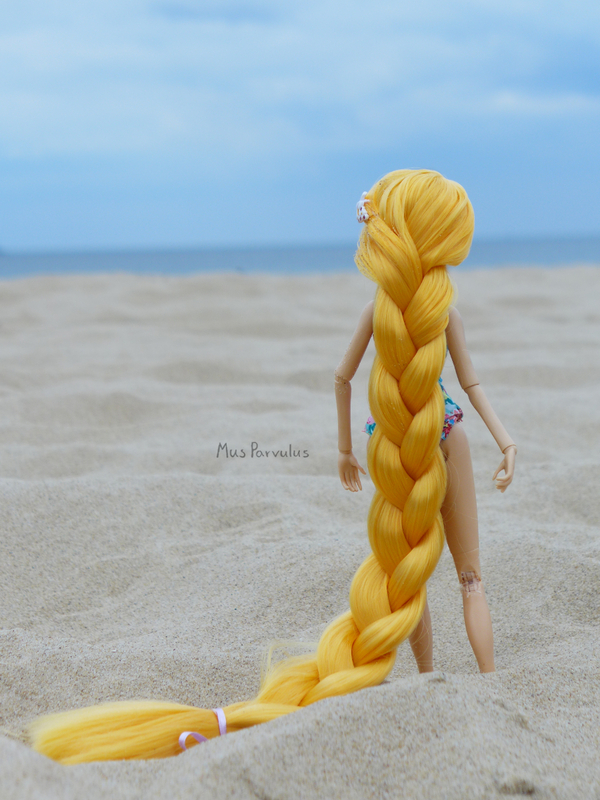 I love tiny doll accessories, and I love it when you stumble upon them in unexpected places. 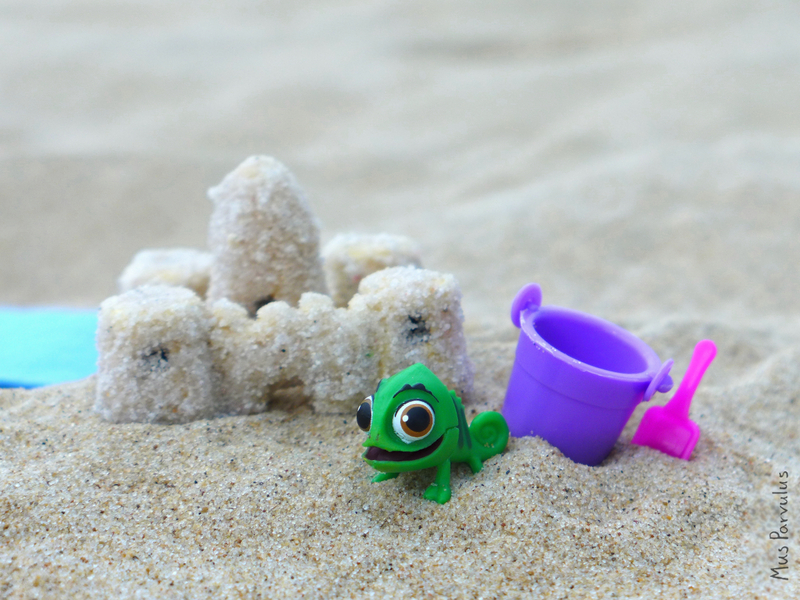 The cute bucket and shovel in the next photo came with a children’s magazine about pets. It’s always worth keeping your eye on these. Supposedly taking photos at the beach is tricky, and I believe I have experienced it on that day. Even though it was cloudy, the photos had a tendency towards being overexposed and the sky was often all washed out. 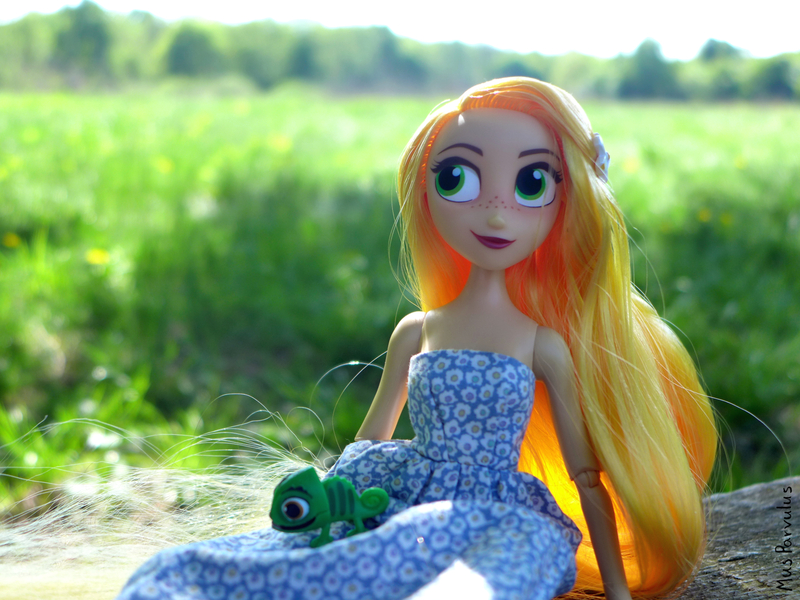 I like to use wide aperture with doll portraits (the blur is pretty and it hides the oversized details of the landscape), but it was making matters worse. I really am no expert in these things, but opting for a very low ISO and messing with the EV setting helped to tame the light. Unfortunately, I haven’t been able to get the sand out yet. 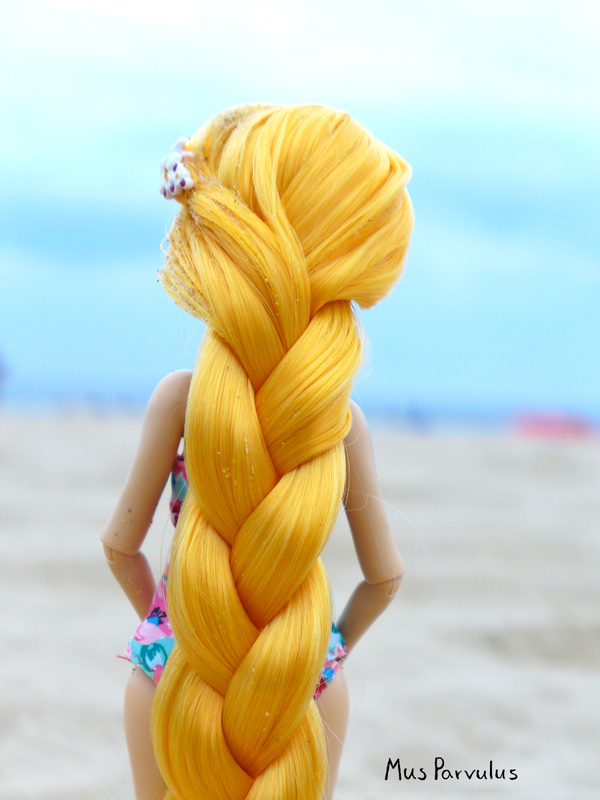 With any other doll, I would simply rinse it out, but I happen to really like the way her hair is gelled into an arch over her face and I don’t want it to dissolve. Coincidentally, that gel, too, seems to be great at trapping the grains of sand 😉 Still, I guess it was worth it. If you’ve been nice enough to drop by Muscellaneous during the summer, thanks a lot! But I also owe you an apology – there hasn’t been much to see. 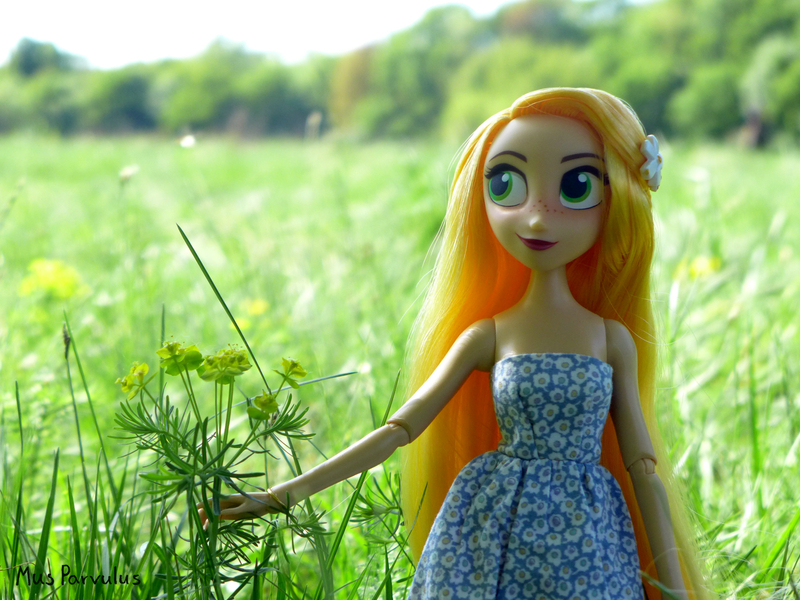 I have been taking doll photos as usual but never got to sorting and editing them. Oops! I intend to start fixing that now. I have decided to start a Flickr account to supplement my blog. I am always a little sad to see horizontal photos all squashed and tiny in the blog posts, and I figured that Flickr would be a good alternative viewing option (plus you can save precious storage space by embedding pictures from there to here). The blog is of course staying – I like to to think of it as my little personal HQ in the vast Internet and a place to share thoughts in-depth, and that’s something I want to keep. There isn’t a lot to see on my Flickr yet, but there sure is something! 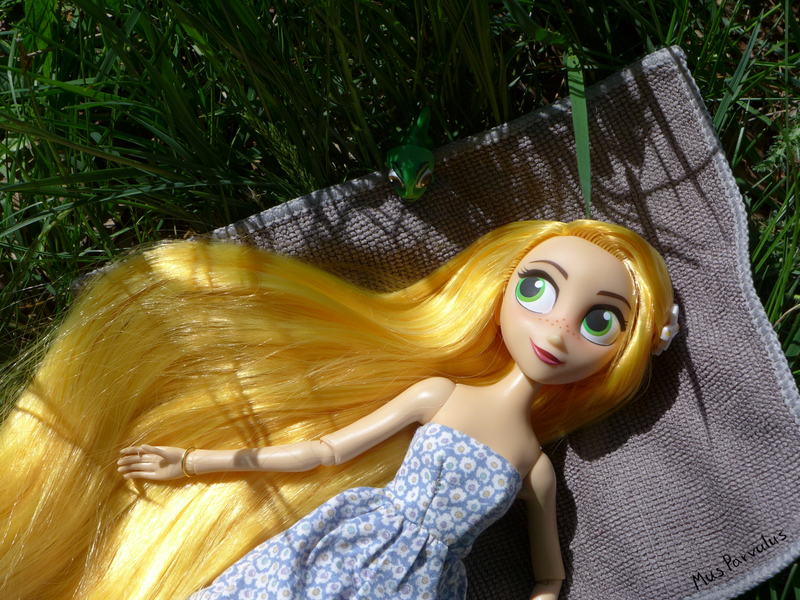 I have already uploaded a batch of summer doll photos for an upcoming post. It is coming soon with more details and insight, but feel free to take a sneak peek 🙂 In the future, I would like to update both platforms at more or less the same time. Eventually I would like my Flickr to have all my earlier photos as well, but I think I will work on that gradually, re-uploading photos when the season is appropriate for a given theme. Something in me just can’t get used to the idea of re-uploading winter, spring and Easter photos right now.